Steve Reed OBE, the Progress MP for Lambeth South/Croydon North (delete according to taste) has entered the row over the closures of four Lambeth libraries, including Upper Norwood Library losing all its professional staff at the end of April, by describing those who want to protest against such cuts as “disgusting”. So much for political discourse. Reed was responding to a protest planned for tonight at a political fund-raising event for his former colleague on Lambeth Council, Florence Eshalomi, who is running in the London Assembly election as Labour’s candidate for the safe seat of Lambeth and Southwark. It is less than two years since Reed, whose parliamentary constituency includes Upper Norwood and whose political agent is a Croydon councillor for the area, carried out a political stunt of signing the “Upper Norwood Library Declaration” with Croydon Labour leader Tony Newman, which they claimed would guarantee the century-old institution’s future. But on Monday, Lambeth Council sounded the death knell for Upper Norwood Library and three other branch libraries in their borough. From April 30, professional staff will be removed from Upper Norwood, which will become a self-service “community hub” (whatever that’s supposed to mean), operated by volunteers. Library campaigners in Lambeth, including trades unions defending their members’ jobs and Labour Party members, have been active in opposing the closures and proposing alternatives. It made Monday night’s Lambeth cabinet meeting held in a school hall in Kennington a rowdy affair, as the “co-operative council” is also proposing to bulldoze social housing on Cressingham Gardens for redevelopment – or “social cleansing”, as many opponents see it. Public service unions in Lambeth are staging a two-day strike, which began yesterday, against the library closures. Eshalomi is a councillor for Brixton Hill ward, the same area Reed represented before he was handed the job-for-life as Croydon North MP. When Reed was Lambeth leader, he promoted Eshalomi to the cabinet role for culture – including library provision. Her recent Town Hall voting record shows that Eshalomi has voted for the library closures (as well as every other cut and for council estate demolition). Library campaigners therefore decided it was legitimate to lobby Eshalomi, and will be attending a fund-raising “pizza and politics” event being hosted by Heidi Alexander, the Labour frontbencher, and Bermondsey MP Neil Coyle in Walworth tonight to do just that. Information about the protest has been distributed in Lambeth by members of Momentum, the grouping formed to support the leadership of Jeremy Corbyn. It is this latter point which has irritated Reed, somewhat more than the closures of public libraries. Reed is a leading member of Progress, the Blairite party-within-the-Labour-Party, which has received millions of pounds in backing from Lord Sainsbury and which has been energetic in purging the Labour membership, in Croydon as well as Lambeth, of new members attracted to the party since Jeremy Corbyn stood for the leadership. “Disgusting that Momentum idiots picketing young black female Labour candidate’s fundraiser instead of backing her,” Reed tweeted after reading the story in a Murdoch newspaper. Reed also described the library lobbying as “bullying” and “unacceptable”. Reed does not seem to have considered what might be seen as more “unacceptable” – such as the abandoning of manifesto commitments by his former council colleagues, the implementation of Tory austerity policies, the ignoring of alternative proposals – on housing as well as libraries – by the unions, or the political incompetence and imbecility of the Labour leadership in Lambeth to push through such unpopular measures in the weeks before an important election. 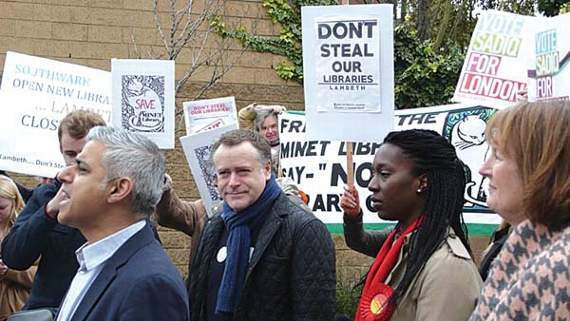 Sadiq Khan, Labour’s candidate for London Mayor, and Eshalomi were confronted by library campaigners at the weekend, with Khan having to deal with placards stating “Lambeth kills our libraries”. The Murdoch press, and Progress’s Reed, has used tonight’s protest to try to dismiss the library campaigners as far-left militants. In a kettle-calling-pot moment, Reed referred to “entryism” and sought to prescribe who should be allowed to join Momentum. Reed is not alone in vocalising opposition to the army of new members who have signed up for Labour since Corbyn became leader. Chuka Umunna, the MP for the neighbouring Streatham constituency who nearly ran for the Labour leadership but then had second thoughts, described tonight’s picket as “madness”. But then, with parliamentary boundary changes coming, there will be a few MPs, perhaps including Reed and Umunna, who may yet be subject to re-selection processes, where they will have to make their case to the new, larger constituency membership. It is worth noting that the Murdoch press – in the midst of the massive Government meltdown on economic policy – has today launched another attack on Corbyn’s leadership, with the publication of a list of Labour MPs, purportedly drawn up by the leader’s office or someone close to it, in which their levels of loyalty were rated into five categories – from loyalists in a “Core” group, through to “Hostile”. On reading the newspaper, Umunna will have found himself in the “Hostile” group, along with former deputy leader Harriet Harman, and Sadiq Khan. Reed, who was confirmed in a shadow minister’s job under Corbyn, is rated only “Negative”, and not outright “Hostile”. This may surprise many grassroots party members in Lambeth South. It is widely believed that it has been Blairites who were behind the attempt to kick Andrew Fisher, a Corbyn adviser and Croydon resident, out of Labour, as part of a Progress purge intended to maintain their grip on power. In the meantime, Reed’s somewhat patronising defence of his friend Eshalomi, as a “young black female”, has not been commented upon. These factors did not seem to bother Reed too much in 2012 when he sacked the “young black female” from his council cabinet over her mishandling of that year’s Lambeth Country Show. This entry was posted in 2016 London elections, Croydon North, Florence Eshalomi, Lambeth Council, London Assembly, Sadiq Khan, Steve Reed MP and tagged Croydon North, Florence Eshalomi, Lambeth, Lambeth South, London, London Assembly, Mayor, Sadiq Khan, Steve Reed OBE. Bookmark the permalink. Shame on you, Steve Reed and other Labour councillors too, for your lack of integrity. The way things are going, the next generation won’t even be able to spell the word integrity, let alone act with it! I would like to express my disgust at the New Labour mantra of “education,education,education,”I believe Reed is a new labour guy.I see this attack on libraries as an attack on working class education and primary school literacy,and remember the enormous contribution of public libraries to my own childhood climb up the ladder. This January came a deeply concerning OECD comparison report. It has woeful economic consequences.Our 16-19 year olds have the lowest numeracy and literacy scores of all developed countries.ALL of Labour’s and the Tory’s rhetoric and change-the-goal-post gaming has produced an awful result. I am sure closing libraries will help a lot! The next thing will be ritual book burning , a Labour Council should defend libraries . public. 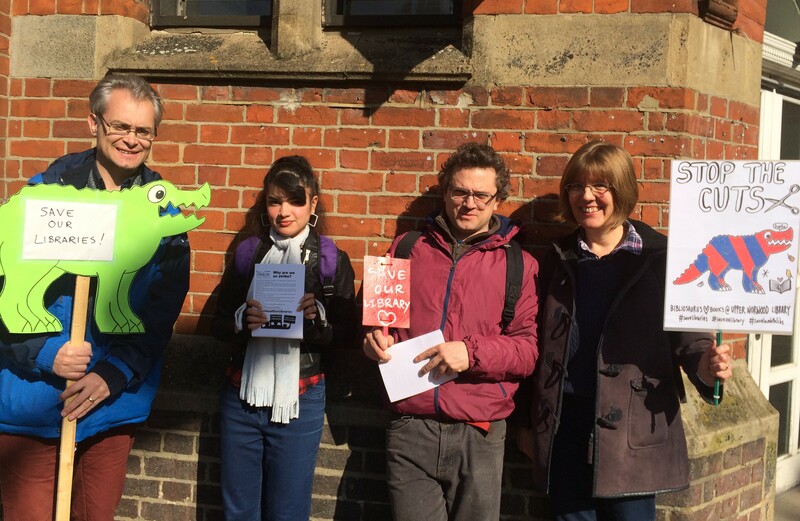 Why are Lambeth denying its residents access to books ? I spent a lot of time in libraries as a child, have a degree, ‘The Levels’ etc., etc but I still struggle to understand communications from the council. Their use of ‘big’ words are designed to alienate, confuse, exclude and encourage general apathy amongst their own the citizens; the people they are paid to represent. What chance will our younger generations have? Will they be like the Croyster Mushrooms? (Kept in the dark and fed s**t). What is disgusting lobbying? heckling with your mouth full of food. Wearing clothes that dont match. Using profanities, Inside Croydon should find out. This is the face of Labour under Corbyn, people say the Tories are split. The way Croydon and Lambeth Labour Councillors act with impunity is having a detrimental effect upon any election success and driving traditional support away with actions and behaviours like Cressingham and Libraries. I firmly believe that Labour lost votes in Croydon Central because of Newman and his colleagues and their arrogance, Lambeth is replicating that for the forthcoming Mayoral elections. They are quick to appear for a populist photo opportunity but their actions and behaviours lack depth and substance. Croydon is mortgaging itself on land values, Lambeth is following suit! Steve Reed was leader of Lambeth before becoming MP for Croydon North. He’s simply carrying on what he started in Lambeth, and Lib Peck, the current Lambeth leader and her cabinet, are are carrying on what he started with gusto – social cleansing is alive & kicking in Lambeth Council! Libraries are part of the hub of our community and in this democratic society people have every right to demonstrate against their closure without being described as “disgusting” What I find disgusting is that Reed managed to con 33,500 people in Croydon North to vote for him at the last General Election only to go on and behave like this. It smacks of Winston McKenzie and even he managed to poll almost 3,000!. I suggest opening a dozen or so libraries in this constituency. It appears to me that the residents need “education, education, education” (or something along those lines). All councils are being placed in an invidious positions by financial cutbacks and being forced to make decisions that are unpalatable to many. The problem is for Labour it is still shackled to the likes of Mr Reed where you really wouldn’t believe they would act any differently from the Conservatives in the same situation. This is reinforced by the petty politicking going on within it and the inability of figures like Reed to rise above it. Do you know what I found a piece of paper in a Westminster pub stating that really Mr Reed is a Conservative fellow traveller. This is what our political life has been reduced to now. What is more disgusting is attempts by the Labour right to shut down critical voices. Also, Steve Reid is being very disingenous. People in Lambeth Momentum do back Florence, Momentum exists to get Labour elected to every level of government, even if they are members of Progress. Clearly though, in his narrow and sectarian world, you can’t even organise a peaceful lobby of elected local politicians to defend libraries.